Social signals are a website’s collective shares, likes and overall social media presence on the web, or more specifically, Search Engines. They contribute to a page’s organic rankings and citations. Their relevance in search engines rankings has prompted marketers and businesses to invest in Social Media SEO. Social media signals have come a long way in how they impact SEO over the last years. We’ve moved past asking if they play a role in organic rankings, to determining exactly how strong social media signals correlates to rankings. Social Signals SEO is becoming more and more important for businesses and internet marketers in today’s world, yet not a whole lot of information is available on the subject officially, but there are several studies with data that supports just how important social signals are for SERP rankings. Google and other search engines have kept suspiciously quiet regarding how social signals affect SERP rankings. It’s one thing for search engines to interpret how content is shared on social media platforms, but how can search engines determine if the author is an authority in his/ her field? Are they gathering information on the author? Do they review our interests as individuals and affect the SERPs results depending on what we like, and share? This is obviously a taboo topic that Google and other search engines don’t like to discuss, so we’re going to stick to analyzing the available data and tell you how you can leverage social share links to your advantage. I’d like to refer to an article Search Engine Land (SEL) published some time ago. They basically asked Google and Bing a series of questions that, I think, can give us an idea exactly where social signals SEO should be today in terms of development. 1. Question: SEL asked Bing and Google, if content that was retweeted or referenced often in Twitter counted as a signal of the author’s authority in the search engines. They both answered it did, metrics such as how many people follow the author (and how many he or she follows) were also relevant numbers for the search engines results pages and news ranking pages. From this, we can gather that search engines have an authority rank for users (!!!) and that this rank gives a social signal more weight. You can see Google sideline the issue of privacy in this answer. But Google’s algorithm has evolved in such a way that we can confidently say it uses social signals as a way to calculate authority. Social Signals SEO is not only about getting social media signals, it’s also about establishing businesses and brands as authorities in their industries so that their Tweets and links have more impact on SERP rankings. Does Social Signals Boosts My Google Rankings? Google has also picked up on the fact that social media acts as a customer support tool for businesses, so they’ve begun to take into considerations interactions on several platforms, such as Google Local, Yelp, and many others. Some of the interactions can be comments, reviews, likes, etc. Likewise, Social Signal SEO experts have ways to successfully replicate these interactions and kick-start businesses presence on the search engines. In fact, it’s often recommended as part of a global internet marketing strategy for businesses. There are of course many more.You could argue that Google is picking up on user interactions, not just numbers of likes and whatnot. Later in this guide, we’ll talk about some of them, as well as give you tips on how to get social media signals for your business. Whether or not you should get them, or leave Social Signals SEO be handled by a professional. Keep in mind that just like in traditional SEO, there are ways to naturally create social signals or you can simply purchase social signal packs. We’re going to give you tips on how to get social signals for your business later in this guide, but it’s important that you know the costs associated with them. What’s The Cost Of Social Signals? Here’s the thing: having a good social media account isn’t just having a cool looking avatar and a lengthy profile, it’s about interacting with your users and providing them with regular content they can comment, like and share. Having a community manager who is specialized in this field can be expensive, especially if he or she is tasked with social media networking. In order to establish yourself as an authority in Google’s eyes, you’ll need to reach certain thresholds in likes, comments, etc. Getting these organically can be hard. So, creating these social media signals requires Social Media SEO professionals that know how to tie everything together. Many business owners try to take over their social media accounts, but very few succeed. Truth is, building social media accounts and brand awareness is a difficult task, which is why many businesses surgically invest in social signals SEO packs that allow their businesses to get their ROI in the form of search engines organic traffic and conversions boosts. Once they’re an authority in their field, hiring someone to properly network in social media is well worth the investment. Social signals are another metric in the complex field of SEO. It’s important that your business fully harness the potential social media platforms have to make content go viral over the internet. We’re going to give you some tips that are guaranteed to boost your social media signals and social engagement. Post regularly: It’s better not to have a social media account than an inactive one. Imagine you’re browsing industry leaders that you follow on Twitter and come across someone that hasn’t posted in well over six months. You’re probably going to think he either retired or he’s no longer up to speed on the newest industry trends. Having an active social media account instantly reassures prospects they’ll be in touch with someone that is up to date with the latest news and prompt further interactions. Listen to what people are saying: It’s critical to listen to your audience. What are their concerns? What would they like to know more about? Having insight directly from your audience on future trends is the key to creating great content, and you can get this valuable information for free! Also listen to their critiques as long as they’re constructive. No need to feed the trolls, but it’s important to be aware of our shortcomings and figure out ways to fix them. Monitor your Social Media activity: Tracking your Social Signal SEO efforts is absolutely key to getting the most value out of them. 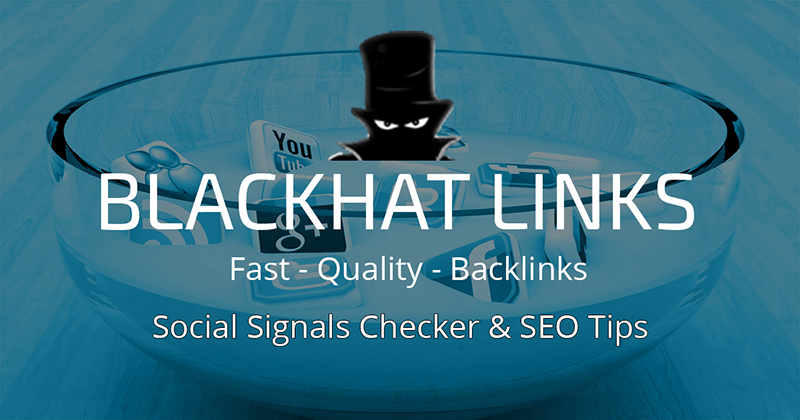 We at Blackhatlinks.com have developed a thorough Social Signals Checker Tool you can use. Knowing what’s currently working for your business and what isn’t is critical to any business. With our tool, you’ll have all the data need to make quick and smart decisions in the long and short-term. Use images: Images greatly increase user interaction rates for all social media platforms. So make sure you include images relevant to your publications every time. Brand them with your name or business as well. Have shares and connect buttons in your website: Share buttons (like, recommend, tweet, bookmark etc.) and connect buttons (like a Facebook page, follow on Twitter, follow on LinkedIn, etc.) are a must. You want your content to go viral, and you want it to be as easy as possible you should add some buttons. Prospects are more likely to share your content if all they have to do is click a button. For our Social Signal Packages it’s not necessary to add a button to your website. It’s just for the user, so he or she can easily share your content. Set up your company blog: Setting up a blog lets you publish content in your own terms. Then all you have to do is make sure the quality content gets noticed on the social media platforms. Blogs are an excellent traffic funnel and domain authority building tool, so make the most of it. Pose questions: Users are 21% more likely to engage in a post that poses a question. Questions prompt users to interact and respond, and it’s a technique that works on social media and YouTube videos. Ask your social followers for a like: If you ask your followers for a like or share in a tasteful manner, there’s a 400% increased chance that they’ll actually do it! Get your followers to comment on your blog: Google views comments on your blog as a sign that you have an active community on your website. It’s a very important social signal, so be sure to prompt your followers to drop a comment on your website! Should I Create Social Signals On My Own? Should you create your own social signals for your business? Short answer: NO! Long answer: Absolutely not! You should leave that to a professional or go the hard and time-consuming way and slowly build them over time naturally. Google is not stupid. They constantly tweak their algorithm and have increasingly effective spam filters and detectors that allow them to spot unprofessional fake reviews, comments, and likes instantly. There’s a lot of testing and data processing that allows us to know exactly what works and what doesn’t. This empirically obtained data is not public. So, amateurs that sell “social media boosters” will either harm your business and brand or at the very least, provide very little benefits for your money at a high risk. Better stay safe and purchase your Social Signals here at Blackhatlinks.com. We are the market leader for Social Signals with more than 25,000 processed Social Signal orders. How To Check My Social Signal Status? We’ve developed a social media checker tool that’ll let you monitor your Social Media signals and track every aspect of your social signals SEO campaign. You’ll get real-time information and data that is critical to optimizing your social media engagement metrics so that you can passively increase your organic traffic and ranking in the search engine’s results page. Websites with strong social presence are more easily shareable and accessible and easier to recommend to others. Websites with strong social media SEO campaigns tend to have better conversion rates and brand loyalty since positive reviews encourage users to take actions (signing up for newsletters or even sales). Remember to check out our Social Media SEO packages for your business and brands. Join us at the top of the SERP listings!